Put the eggs in a saucepan and fill it halfway with cold water. Set over high heat. When the water boils, turn off the heat and place the lid over the pot of eggs and let sit for 10 minutes. Place the eggs on a cutting board and cut a quarter off the egg from the fat rounded end to expose the yolk. Next, cut just a sliver off the opposite end, the pointed end, so that the egg is able to sit upright without rolling over. Once all the eggs have been cut, scoop out their yolks into a medium size mixing bowl. Place the egg white halves back into the egg container for easy transport and filling, making sure the holes are pointing up so that you are able to fill them with the Caesar mixture. To the bowl with the yolks add the anchovy paste, Worcestershire sauce, mayonnaise, garlic, onion, Parmigiano Reggiano, lemon juice, salt and freshly ground black pepper. Mash up the yolks with a fork until the mixture is paste-like. Mix in half of the shredded romaine, reserving the rest for garnish. Spoon the egg mixture into a plastic, resealable bag and squish it all into one of the bottom corners. Snip off the corner and squeeze out a bit of yolk mixture into each of the egg whites. Once all the eggs are filled, place a little bit of shredded romaine on top of each for garnish, close the container lid and you are off to your party! In Recipes-list.com we have selected the most viewed recipes from category - uncategorized . Enjoy the best recipes specially selected for you! 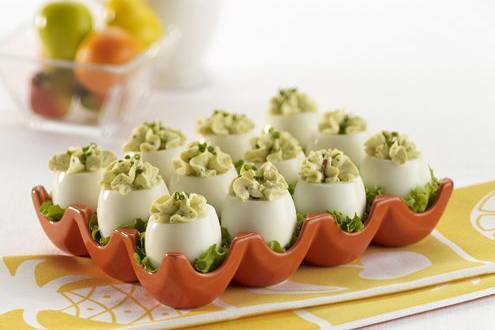 Caesar-Stuffed Eggs is the right choice that will satisfy all your claims.